Achaar- pickling dried vegetables in brine or mustard oil. Achaars often have a pungent, sharp smell. Chutney- soaking pieces of fruit or veg in vinegar, tamarind and spices. Chutneys can be thinly sliced fruit and vegetables or be a jam-like consistency. 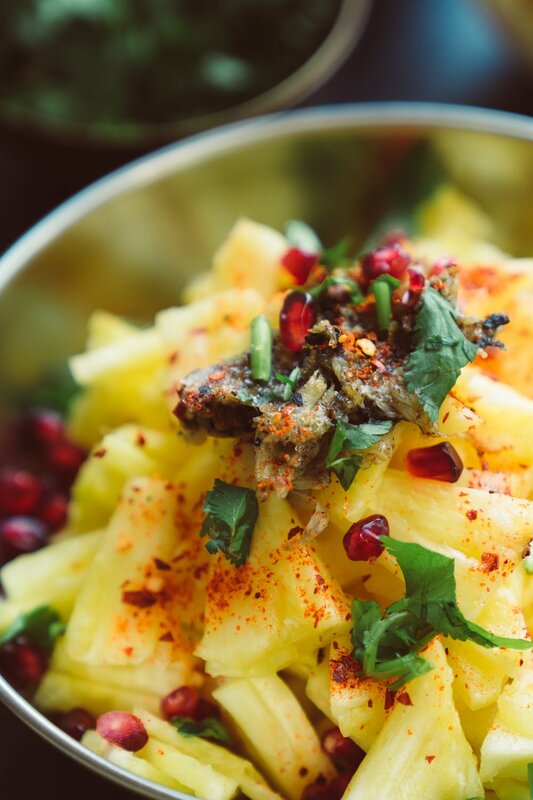 As an ode to that 20 year old memory of scooping tart spiced fruit out of a jar and licking my hands clean, I’ve decided to share this pineapple chutney recipe that always resurfaces during the warmer months when dawats and balmy evenings in the garden are aplenty. Something about the taste of sweet, sharp pineapples and lashings of tempered chillies always make me yearn for humidity and time to do absolutely nothing! Prepare the counter and have all spices, chilli and coriander ready for mixing. Peel and core the pineapple. Cut the remaining fruit into wedges and then thin chunks. Leave this bowl aside for later. Tip: If the pineapple exterior is still mostly green, leave it out in sunlight for a day or two so it ripens. Peel cloves of garlic and wrap in tin foil. On a gas or electric hob, place the ball of garlic cloves on the edge of the hob on a medium flame. The aim is to char the garlic to give the chutney a smoky aroma. This won’t take more than two minutes. Once charred, allow to cool before you remove the tin foil ball carefully (I usually use my hands and hurl it into the sink under cold water!) 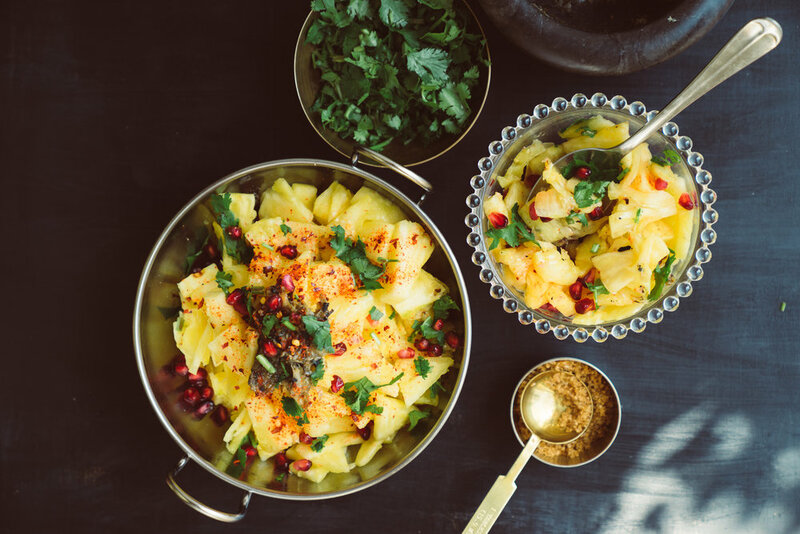 Place in the bowl with a pineapple, alongside all the remaining ingredients, including the mustard oil. This is my favourite bit: with your hands, mix the pineapples with the spices and mash the garlic into a paste. If you squeeze the pineapples, you’ll end up with a lot of juice so try not to turn the whole thing into a pulp- unless that’s what you’re after. Depending on your tastebuds, you can leave the chutney as is and serve immediately. If you went overboard with the salt or chilli, I find brown sugar often balances the flavours out. Note: as this is a fresh chutney without strong preservatives like vinegar or heavy amounts of oil, it won’t keep for long and I wouldn’t recommend having it in the fridge for more than a day! Follow the Golden Tiffin girl for updates and BTS antics!